I have to admit I really like the new Microsoft To-DO app for Windows and Android. You can create lists of to-do’s, it has a My Day function and lots of useful detail. Once I’d created my first set of serious to-do’s I suddenly realized how much sensitive data there was in my to-do’s. 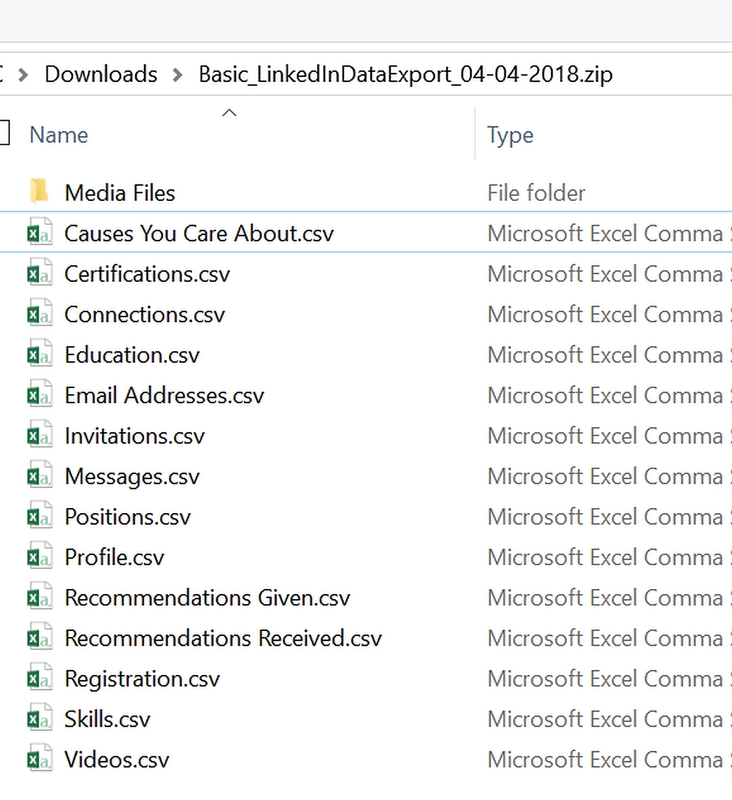 While I’m ok with Microsoft collecting and analyzing usage data, how many times I use the app, what platforms, where was I when I used them etc. I’m totally against them reading, copying or sharing the to-do’s with anyone that I have not explicitly authorized. Microsoft Privacy Statement – November 2018. My Microsoft Account Privacy Settings. I couldn’t find a definitive answer anywhere. 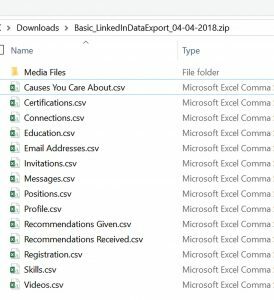 Does Microsoft scan the data inside of TO-DO’s, or for that matter DOC files, XLS files shared and in the “cloud” in order to harvest trends, ad targeting etc. For me this will be an absolute deal killer. I’ve submitted a question to the privacy team via this form, this will be interesting to follow-up on. For me, my TO-DO’s are much more sensitive, private than anything I ever posted on facebook. My support ticket number: 1463236572. Here is the text of my question. 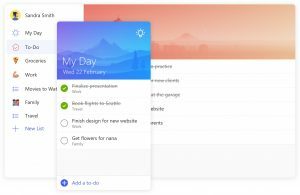 Microsoft TO-DO is a new app for Windows and Android etc. I’ve searched the various privacy and trust dashboards and cannot find anywhere that allows me to be sure that the CONTENT of my TO-DO’s which could be highly sensitive, is not shared or read by Microsoft for any purpose except back-up and sharing among systems I choose. For example, I may have a TO-DO that includes make bank payment to Jeff and includes his bank routing code and account number. How can I be sure you will never scan and retain or copy such data for purposes I have not explicitly authorised? Except as described in our Microsoft Privacy Statement, we won’t disclose your personal information to a third party without your consent. We do not use what you say in email, chat, video calls, or voicemail. Nor do we use your documents, photos, or other personal files. As of its longstanding commitment to privacy, Microsoft provides resources to help you protect your part online information. Please find additional guidance at the Privacy at Microsoft page. Which I read as they never process your actual data files, and sell the information contained in them. Which includes .doc, .xls, etc. So, that’s carry on with Microsoft To-Do. I teetered on the brink of deleting my facebook account last year. I removed the main app from my phone and a Windows tablet, and have never installed messenger. When it came down to it I balked at the final step. I did ulike pretty much all businesses and pages, as well as unfriended anyone not a real contact/friend etc. The utility of facebook is still too great to remove myself completely. Although frankly I’ve had better results contacting businesses through Twitter and getting things done. Given it’s reach, facebook still remains useful. Delete the apps Facebook, Facebook Messenger, Instagram and Whatsapp. If you want to delete your facebook account, it’s still relatively simple and you have 14-days to recover it, if you decide it was a mistake. Use this URL. The Guardian published this over the weekend. It’s a long and important read that contains all the context and background detail into how Facebook was used to target people with advertising and social profiling of potentailly millions of people to bias or persuade them to take a particular perspective. Much of this data came through those terrible apps which ask you to confirm access to your facebook profile, and your friends profile. Even though you may have never used one of these apps, if your friends did, they likely gave away your data. 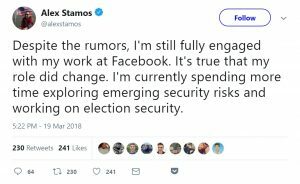 The New York Times is today reporting that Facebooks Chief Information Security officer is leaving the company. So this is obviously a big deal. Alex himself denies that, although with the share price drop already seen today, who knows the truth, the data misappropriation is still a big deal. 1. 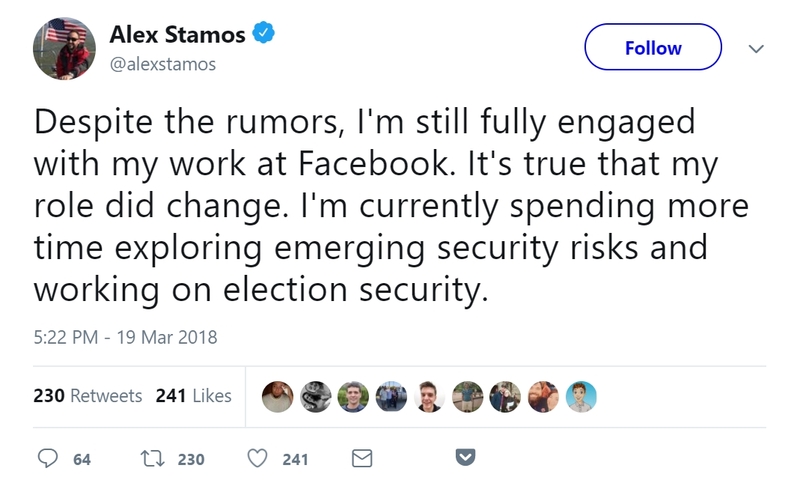 Why did Facebook take more than two years to inform the public of this massive breach? 2. Did the Trump campaign or Cambridge Analytica violate campaign finance laws? 3. Did Trump campaign or Cambridge Analytica employees lie to Congress, or to the British Parliament? 4. Did Facebook’s failure to disclose this breach to the public and notify its directly affected consumers break any laws? 5. Did any of the Facebook embeds in the Trump campaign know that stolen data was being used for targeting? 6. Did Facebook have evidence its own employees mishandled this situation? Was any disciplinary action taken? 7. Did other organizations or individuals exploit these apparent weaknesses, and are there other breaches we do not know about? Irrespective of what you think about how the data was used, and the outcome, these questions need to be answered. We had a spirited discussion over coffee today about the whole NSA data collection fuss and sparked by the continuing refusal of the UK Government to accept there is a case to be concerned, even if you have “nothing to hide”. Think of it this way. You are sat at home, there is a knock at the door. You answer it’s that nice man from the NSA, he says “excuse me, we’d like a few minutes of your time, can you just write down every phone call you’ve made in the last 3-months, what time of day you made the call, what number you called, how long the call lasted.”. – you say why, they say, dunno, may make some sense in the future. Going to give it to them? Going to call a lawyer? Done anything wrong? – well good news, you don’t need to, they won’t come knocking, they’ve got all the data anyway. Then, remember that phone call you had? You know, the crazy guy that your cousin thought would be a an interesting match up, he called you? No? Well never mind, the NSA does. He called you from his Walmart cellphone, me they want to know what you discussed. At the time when he ranted on about the PM of Saudi Arabia you never gave it a 2nd thought, turns out a couple of years later the PM was assassinated by some nut job who had that phone on him… You remember what you said? Dam right the NSA shouldn’t have any of your digital data unless they get permission from you, before collecting it.